snapped tonight, post dinner, and yes, that is what my manicure currently looks like. Don't take this the wrong way, but I legitimately loathe you. How is it that Dinner shows up at the worst part of our day, every day? Right smack in the middle of the newborn's Witching Hour and my pre-schooler's nightly meltdown over his socks being too tight, Dinner presents itself in the form of an empty fridge and a hungry family. And just for the record, even if the fridge wasn't empty, there would still be "nothing to eat". I nightly praise the Gods Of All Things Processed for microwavable mac + cheese cups and yogurt in a tube. Somehow, while wearing a screaming baby and finding the Everest episode of Paw Patrol on the DVR, I'm supposed to scheme up, organize and prep a beautiful meal, all while fighting the urge to lie down and mainline boxed wine. Oh, wait. Was I supposed to have taken my two wild beasts to the actual grocery store with a list and a prayer in order to pull this whole Dinner thing off? Yeah, thanks but no thanks. Let me be clear here, it's not just the actual meal prep that fuels my hate fire. It's the process of dragging everyone to the table, ideally with pants on, requesting that everyone use their napkin and that no one wipe their boogers on anyone else that really wears me down. I mean, how many times can one woman say "we don't put our feet on the table!" before losing her mind? Hint: the answer is infinity. And then. Then, after all of that effort and Pinteresting, Dinner is over in two minutes flat, barely consumed and discarded for yours truly to clean up. So many dishes, so little cares to give. 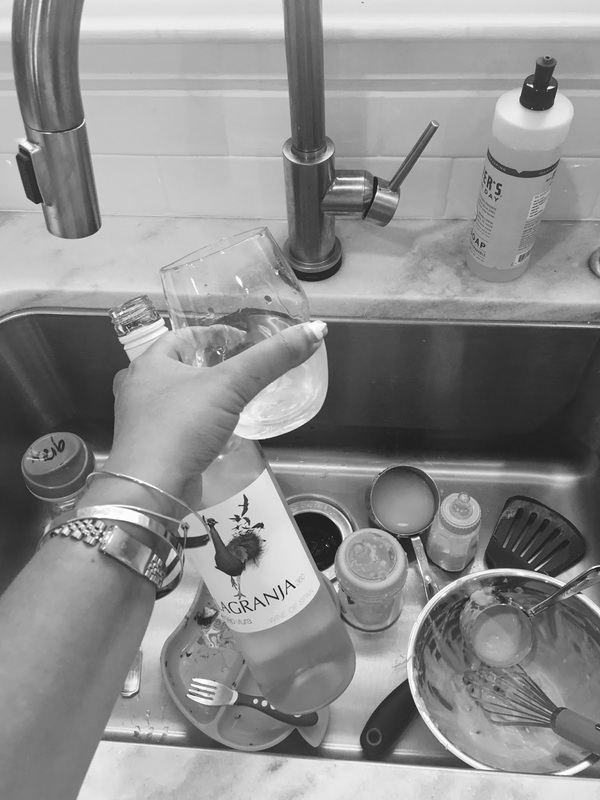 The only silver lining to the endless cycle that is kitchen clean up is everyone manages to vanish the second the dishes hit the sink... which means mama can scrape plates in peace. And honestly, with all of the dishwasher steam and scented dish soap bubbles, I can close my eyes and almost feel the spa vibes. Almost. It's no wonder my three year old can give accurate directions to Dominos. Amen! I'm so with you! Yep!! I hate it! Especially since 90% of the time I am saying "just one more bite" and attempting to get a 3 year old to eat anything healthy! You might be my spirit animal! I totally feel you on this right down to the Everest episode of Paw Patrol. Cheers lady!